OPP POOL. 3 MIN WALK TO BEACH. REMODELED. 8 FREE BIKE. 2 MASTERS. XL KIDS ROOM. GREAT LOCATION AT THE FRONT OF SEACREST. RENTERS MUST BE OVER 25. Sandy Craic (Gaelic for 'fun times' and pronounced 'crack') is located at the front of the resort. It has both sea and pool views. It is directly across from the entrance to the pool and only a short stroll to the beach. Sandy Craic has recently been remodeled: new side entry way, complete with patio/barbecue area and enclosed shower. We refinished the hardwood, repainted, installed new tile, updated the washer and dryer and purchased new mattresses for the king and queen beds. The house is very spacious, comprising of over 2400 square feet. Each of the 4 bedrooms has its own private deck, complete with outdoor furniture. The house has been professionally decorated, with comfort and convenience in mind. Hardwood flooring or tile throughout the house. The living area has three comfy leather sofas. The dining area has a large table, seating 10-12 guests, with additional seating at the counter.The kitchen is fully equipped, along with stainless appliances, granite countertops and coffee station. The first floor bedroom has a new plush queen mattress, private access to the bathroom and a private deck. A laundry room and bathroom complete this level. On the second floor, we have a kids room , which has 2 sets of bunks (twin over full), a queen sofa sleeper, and their own bathroom. This room is very spacious. There is also a family room on this level, consisting of another set of bunks and a king bed with a new plush mattress. The master bath has a rain shower and garden style tub. You can enjoy spending lazy evenings on the private deck. Finally on the third level we have another master bedroom, with king bed and a new plush mattress. There is also an oversized sofa, that can convert to a bed if needed, or just to sit back and enjoy a good book. There is an ensuite bathroom with a fitted tub. There are fantastic sea views from the private deck of the bedroom. Across the hall there is a covered deck, with cushioned patio furniture, so you can relax in comfort. There is also a wet bar with refrigerator, on this level, for your convenience. There is a selection of free bike, several beach chairs, floaties and beach towels provided for your convenience. CEAD MILE FAILTE (a hundred thousand welcomes) to our house. MAKE YOUR VACATION MEMORIES AT SANDY CRAIC! My husband and I are both from Ireland. We now live in Austin, Texas, with our four children. I wish we lived closer! We choose Seacrest Beach because of the quality of the development, the huge lagoon pool, the tram service, the entertainment and the selection of restaurants and shopping close by. The location and spaciousness of the house was an added bonus! The house is so convenient to the pool, just to be able to walk across the street is ideal. Not to mention the white sandy beach, which is only a few minutes stroll away. toilet, combination tub/shower, jetted tub, 3rd floor bathroom. Walk to the Gulf or avail of the free tram. Walking distance to Rosemary Beach and Alys... great shops and restaurants to choose from. Also weekly entertainment and great restaurants and bars at nearby Seacrest Village. Great ocean views from decks and master bedroom. each floor has a it's own unit. condiments. foil and zippy bags. Table seats 10-12. Counter seats 4 on bar stools. (6) Each bedroom has a private deck. 12000 sq ft lagoon pool, only steps from the house. Great pool views. Beach towels. Beach chairs High chair. Toddler chair. Stair gate. Two families (7 of us) came together to enjoy some vacation together. The place was in great shape, around 200’ from the common pool, and a 5 minute walk to the beach. Would certainly come back if we were in the area! Welcoming, comfortable and family friendly! This was our second time visiting this property and we loved it as much as the first. It is an amazing location, so close to the pool and ocean. The house is decorated nicely but made to feel comfy- like home away from home. We will definitely be back again! Best 30A has to offer!! We had 5 teenage boys and 4 moms to celebrate the beginning of summer and the house could not have suited our needs better!! The bunk room on the second floor was perfect Slept the 5 boys comfortably and plenty of room. The house is decorated nicely, kitchen well stocked, beach towels and beach chairs provided!! And the location of the house is amazing. Right in the front of Seacrest, 5 min walk to beach and 10 second walk to the pool. We never even took a tram to the beach because it was so close. Enjoyed the outdoor spaces the house offered and just had a relaxing get away. We enjoyed biking or walking to the Village area for eating and shopping and Rosemary just a few blocks beyond that. We are planning a family trip next year and when I finalize dates I'm hoping this house will be available!! Our boys wanted newer bikes to ride around so we did end up renting them, rather than using the ones provided. Thank you Jill. Cannot wait to host you and your family next year. Let me know as we offer discounts for repeat customers! Close to beach, pool, and shopping/eating - great location for a family! We really enjoyed our stay in this community and would definitely recommend it to families with children. Was steps from the resort-style pool and walking (or shuttle) distance to the beach. 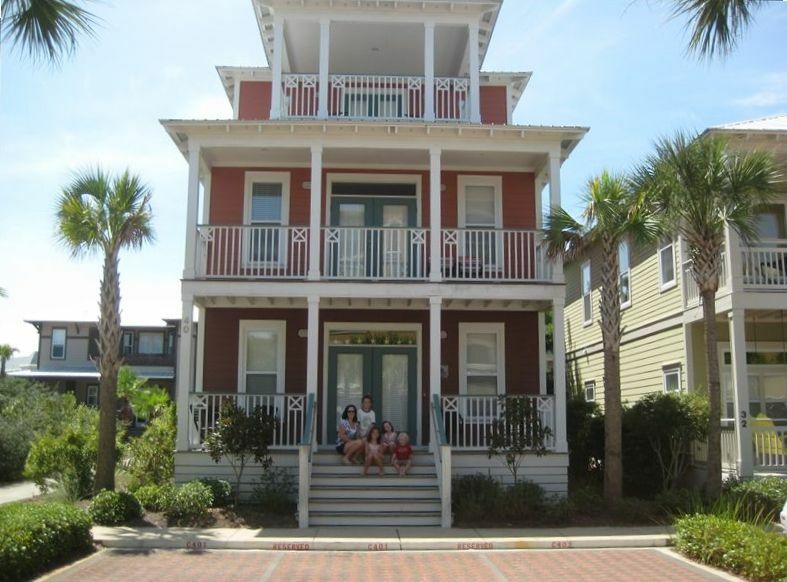 Walking distance to restaurants and shopping, Rosemary Beach and Alys Beach. House was well appointed with everything we needed and owner was very quick to help when an issue popped up upon arrival. We will be back! Easy to get to everywhere - close to beach - shopping - dining - very clean and the staff in the community were very accommodating with directions and questions. We had a great time. Movies at Rosemary and Alys Beach. Live entertainment at Seacrest pool. Deposit refunded, less $150, if canceled 60 days before arrival. Security deposit refunded the week after departure. $100 processing fee for all credit cards.